In both debt plans, the wealthy win. And when taxes come chiefly from the middle class and the poor, all those anti-tax right-wingers have no problem raising them. In an editorial this weekend, the Wall Street Journal termed the payroll tax reduction “an inferior tax cut,” arguing that tax cuts should be “broad-based, immediate and permanent.” Broad-based? The payroll tax cut, which the Journal dismisses so contemptuously, benefits every employed American, while the tax cuts the paper champions — on capital gains and millionaires’ income — accrue to a far smaller group. Immediate? Unlike taxes paid annually or quarterly, the payroll tax is drawn from each paycheck from the moment the law takes effect. Permanent? The payroll tax is the tax that funds Social Security, so reducing it really can’t be a permanent policy. But the impermanence of the Bush tax cuts, which had been set to expire this year but were extended, presented no obstacle to the Journal’s fervent support for them. This tax-Joe-Six-Pack mania doesn’t end with the Journal. While President Obama has made clear that he supports extending the lower 4.2 percent payroll tax rate for another year, to keep the economy from contracting further, congressional Republicans have made their opposition equally clear. 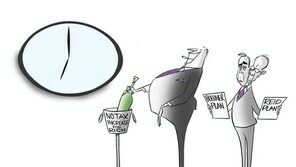 “I don’t think that’s a good idea,” said Dave Camp (R-Mich.), chairman of the tax-writing House Ways and Means Committee. Camp complained that it would push the deficit higher. House Budget Committee Chairman Paul Ryan (R-Wis.), the man who’d have us scrap Medicare, concurred. “It would simply exacerbate our debt problems,” he said on Fox News Sunday this month. This concern for the debt, touching though it may be, didn’t keep Republicans from enacting two waves of tax cuts under George W. Bush. It hasn’t kept them from opposing our current president’s proposal to restore the Clinton-era tax rates on the wealthy. But when we’re talking about taxes on the majority of Americans, those who work for a living and don’t make six-figure incomes, the Republican brain lobe devoted to debt reduction through tax increases goes abuzz with synaptic frenzy. But unless Congress votes to extend it, the lower rate will expire on Jan. 1 regardless of its effect on total taxes. Norquist flat-out opposed letting the Bush tax cuts expire — though he did tell The Post’s editorial board that it didn’t technically violate the pledge, a position that he has since tried to obfuscate. Now that the payroll tax is slated to expire, though, Norquist is lost in contemplation (or something). Congressional Republicans inclined to increase the payroll tax — and I’m not aware of any who have come forth to oppose that idea — can do so, apparently, without fear of being labeled tax-increasers just because they’ve increased taxes. Republicans like to complain that Democrats practice “class warfare” and “the politics of division,” as House GOP leader Eric Cantor argued on this page Monday. What the Republicans’ position on the payroll tax makes high-definitionally clear is their own class warfare on working- and middle-class Americans. Their double standard couldn’t be more obvious: Tax cuts for the wealthy are sacrosanct; tax cuts for everyone else don’t really matter. Norquist, Cantor, Ryan, Camp, the Journal editorialists and the whole Republican crew give hypocrisy a bad name.